AC Milan played in their 4-4-2 structure which had become famous under Arrigo Sacchi just before Capello took over. Though in this match there wasnt as much focus on collectively pressing the area of the ball and the offside traps werent performed as cleanly as under Sacchi. It was immediately obvious that Desailly was told to man-mark Litmanen wherever he went on the field – which left some holes open in the Milan midfield. Litmanen rarely stayed in his #10 position just behind the front 3 of Ajax, rather he joined the forward line to form a front 4 and would do this moving towards either the far or near side depending on where De Boer was. The biggest holes opened up when Litmanen dragged Desailly to the far side so that the area around the ball was not as pressurized and the holes in the center could be exploited by his teammates. When the front two of Massaro and Simone pressed the Ajax back line they would press the two nearest Ajax central defenders. So if the ball went to De Boer on the left, Massaro would move out to press him as Simone would cover Blind in the central position and leave the far side central defender open. This wasnt a bad idea to prevent Ajax from progressing up the pitch and closing down spaces near the ball together, but a problem arose once the ball went back to Van Der Sar. Van Der Sar would simply switch the ball out to the completely unmarked Reiziger who would move up the field with the ball. The 2 AC Milan forwards simply wouldnt shift across the pitch to pressure the ball again or even move towards the center to protect against penetration and assist in isolating the build up. Both Massaro and Simone stayed on their men on the far side of the field. This leads us to the next interesting movement defensively from Milan. Boban, instead of pressing the progressing halfback, would drop away from the ball towards Maldini in the fullback position. This left Albertini and Donadoni in midfield and it was Albertini who had to leave the center of the pitch to press Reiziger most often. This left large gaps open in the center of the pitch (especially if Desailly was forced to the far side of the pitch). Rijkaard would be left with a lot of space in the middle as a result of this and was frequently in position to play excellent vertical passes. Milan relied on one of their two strikers to backwards press and not allow Rijkaard too much time on the ball while the midfield focused on protecting the defensive line instead of pressing as a unit. At times Boban would move into the center of the pitch in front of Albertini in order to apply more direct pressure to Rijkaard as Albertini would care for both his position and pressing the flanks. AC Milan likely had the approach of dropping Boban deep when the halfback was moving up due to the fact that they knew Ajax favored vertical passes and combinations on the flank. This is what occurred most often as Reiziger would play a pass into one of Finidi, De Boer, or Litmanen and they’d try to combine to break through the back line. This was likely Van Gaal’s best team in his career due to the talent of the players and their ability to combine better than the other team’s he had through his career (mainly Bayern and Manchester United). However, even this Ajax side had trouble breaking through the AC Milan defense as they relied mostly on the speed of their passing in simple combinations rather than combining passing speed with movement and rotation in combinations to make it more difficult to defend and more likely to break through. Ajax were giving Milan trouble simply by using a 3-3-4 structure while in possession. This occupied the back line very well while controlling the center of the pitch in both midfield and defense. One of Ajax’s best combinations was when Reiziger played the ball into De Boer who laid the ball off and then Seedorf played Finidi’s 3rd man run through the created space and penetrated the defensive line. Though combinations like this which involved more movement and more players were rare throughout the game and AC Milan ultimately didnt have too difficult a time defending. Another bright moment for Ajax was when Finidi dropped deeper on the wing and Reiziger played the ball into him. Maldini didnt want to leave the defensive line so far to press him which forced Boban to move onto him while Reiziger was pressed by Albertini. As Finidi was shielding the ball and facing towards the center of the field Seedorf made a run completely unmarked down the middle of the field and was able to receive the ball in front of the opponent’s defensive line with options in front of him. This didnt occur often enough as the players stuck to their positions most of the time. Rijkaard, Davids, or Seedorf would occasionally make runs past midfield if they played a vertical ball into a forward and sought to receive a return pass – the use of such lay-offs proved successful for the small amount of times they were used. Van Gaal admitted this wasnt one of their better games and he might have been referring to the lack of dynamic interaction from the players to break through AC Milan – though this seems to be a common problem in his teams. The goal in the final minute was a result of an AC Milan offside trap which was completely uncoordinated and not timed properly. A long diagonal cross attempt to Overmars failed and he chased the ball down and was able to turn back towards the center of the field. He dribbled toward the box and then played the ball across the center of the box to Rijkaard (who was a bit deeper and wasnt being pressured). At this time half of the Milan defense stepped up in an offside trap attempt (and nobody was marking Kluivert in the middle of the defensive line because of this) while the other half of the defense reacted much slower. Rijkaard simply played a short diagonal pass into Kluivert who took the ball into the box with some pressure of retreating defenders and poked in the goal at the near post. Even though Ajax won this match, it was AC Milan who were the more dangerous team throughout the game despite having less possession of the ball. 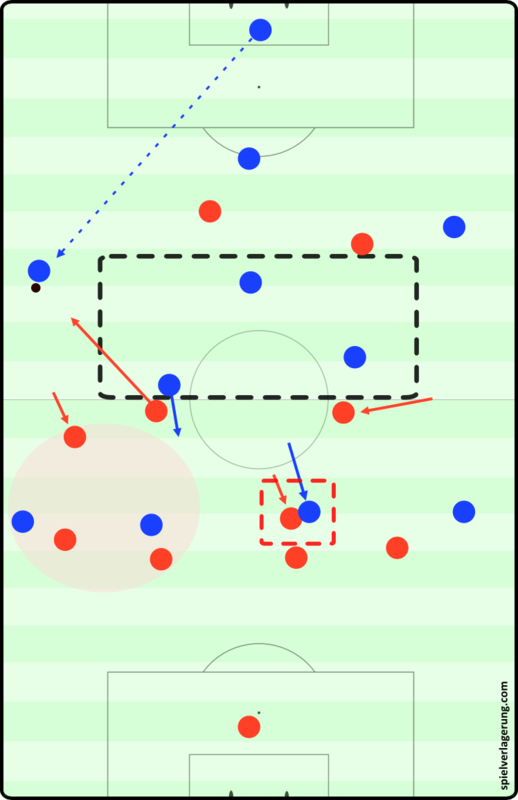 Due to Ajax’s lack of dynamic combinations they won the ball quite often after an Ajax vertical pass and had plenty of opportunities to counterattack (their approach to the game). Simone was a bright spot in regards to the offense as he used his excellent dribbling to beat players down the wing (where he shifted most often to breakthrough) and cross or moved into the center to attempt combinations or diagonal through passes. Massaro had a very poor performance in regards to movement as he mostly looked to make runs in behind the defense with improper timing. Simone would try to play a wall-pass combination with Massaro but Massaro would’ve already turned his back and started running once the pass was played. Many passes attempted through the defense to Massaro were easily intercepted as he was quite isolated and didn’t look to maintain possession and bring the team up the pitch. Simone would frequently drop deeper to receive the ball and help the team move up the pitch. He was very present in possession and attempted long diagonals towards the far post with many runners often – which was the main strategy for AC Milan. He was also intelligent in combinations as he would attract the pressure of Reiziger on the flank and then lay the ball off for a teammate who would attempt a long diagonal towards Massaro against De Boer in a 1v1 at the far post. Though this offensive strategy isnt super efficient, they created a few dangerous chances from this and had good opportunities to score. Donadoni was the other player on Milan which used intelligent dribbling ability to attempt to create from the flank. Both fullbacks of AC Milan pushed up and allowed Boban and Donadoni more towards the center (in the halfspaces) and Desailly would often move forward in the same line with both strikers to provide more of a presence for Milan’s diagonals. 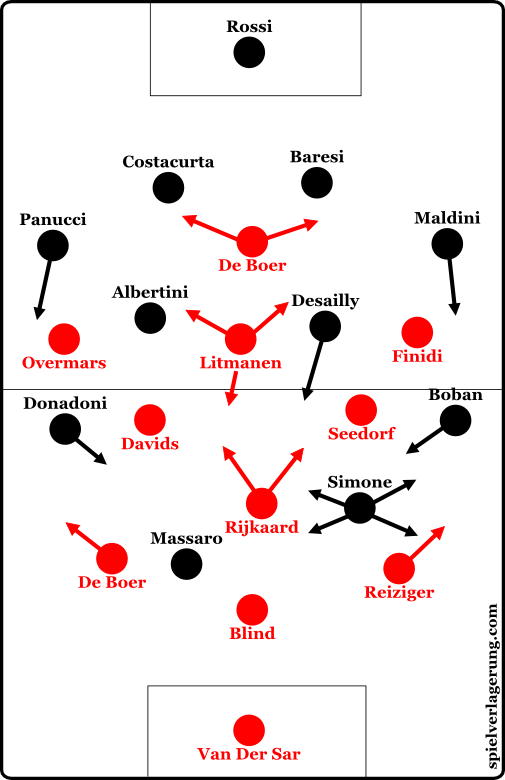 Donadoni frequently tried to play low diagonals into the feet of the forwards but the center of Ajax’s defense was too crowded most of the time for it to work. Simone and Donadoni were the main creators of the side as they used their dribbling abilities on the flanks to try and play teammates into the box diagonally. Maldini pushing up proved quite dangerous as he overlapped Simone (who moved to the flank while Boban moved inside) very often with speed and Seedorf or Finidi struggled to track him. This resulted in easy breakthroughs as Maldini was able to play some very dangerous short crosses into the box which resulted in some good chances. Ultimately, AC Milan didn’t have much of the ball so most of their game was in the transitional phases using Simone while Ajax didnt have to defend in a block. Ajax might’ve had more trouble had a different striker played next to Simone as the moves broke down often due to his poor decisions. AC Milan lacked any real counterpressing during this game so Ajax didnt have a difficult time controlling the ball or quickly regaining control after Milan’s offensive transitions. Overall this wasn’t the most exciting game as Ajax lacked dynamics in offense and retained the ball for a long time while AC Milan wasn’t able to establish proper connection between their forward players when attacking in transition. This resulted in a match with only a few real chances and a very late goal which came from a lapse in concentration from the Italians – which is enough at this level to lose or win you Europe’s biggest prize. This game could’ve very easily have gone to a penalty shootout had Ajax not quickly capitalized on Milan’s mistake!